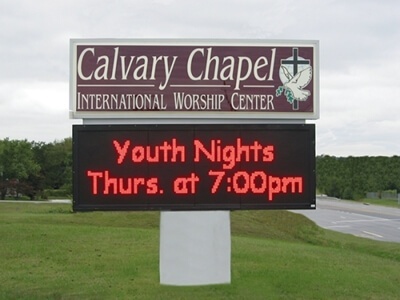 Reach Out To Your Congregation With a Sign From Signdealz.com! Electrical Signs are an important part of directing your congregation, new members, and even existing members around your campus. Signdealz.com makes so many types of signs from Wayfinding Programs to Digital LED message centers. Trust the experts in the sign industry – trust Signdealz.com. 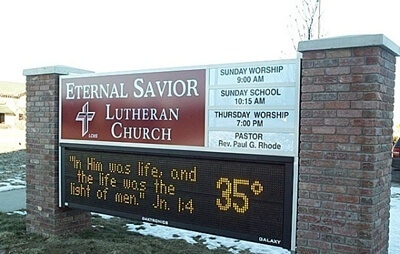 We’ve been providing quality signs to places of worship for decades! Give us a call today, or fill out our web form. Signdealz message centers come standard with control and message creation software and can be controlled directly on-premise or remotely via wireless or internet connection. Whether your message requires full color video, high definition grayscale photography or simple monochrome messages, Signdealz offers a full line of long-lasting, high performance, energy efficient outdoor LED displays to meet your specific communications and budgetary needs.